Sculpture Size: 3.5 X 1 X 2 in. Sculpture Size: 5 X 2 X 3.5 in. Sculpture Size: 7 X 3 X 4.5 in. Elephants are the world's largest land animals. The African variety can be upwards of 13 feet tall at the shoulder and weigh in at 20,000 pounds. Elephants therefore have no natural predators, save for man, who still poaches the protected animals, primarily for illegal ivory. Extremely intelligent, Elephant is very loyal and has been known to risk its own life to protect the family, killing if necessary. The majestic presence of Elephant is extremely enhanced insight and intuition, wisdom, longevity, respectfulness and increased sensitivity to the needs of others--especially devotion to family. 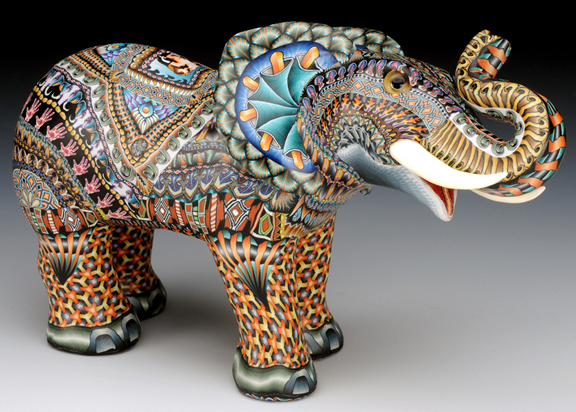 Elephant is an iconic part of Hindu beliefs. Ganesha is actually said to be the father of the Buddha and the Chinese see it as the embodiment of sexuality, royalty and strength of purpose in their culture.